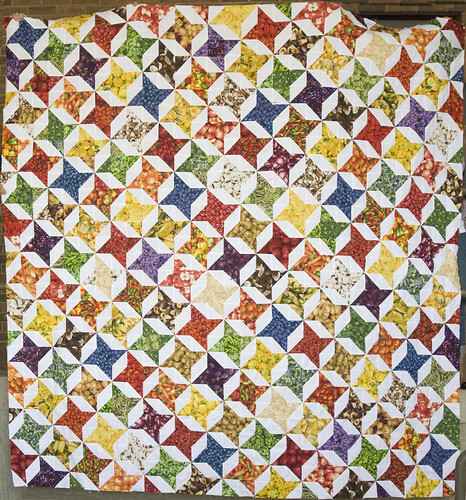 This is another quilt that will wait in the wings for a while. It's been waiting for a while already, and can wait a little while longer. The fabrics were a gift from Jacob, who last year hunted for a set of fabrics that would challenge me. In our friendship, we've adopted the acronym OCP to refer to Iain Banks' penchant for referring to unexpected, difficult problems as "Outside Context Problems." Meaning, problems you simply aren't prepared to solve easily or quickly. So, what he bought for me was food fabric. 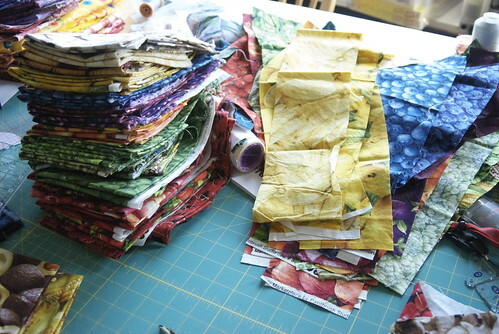 Lots of food fabrics. 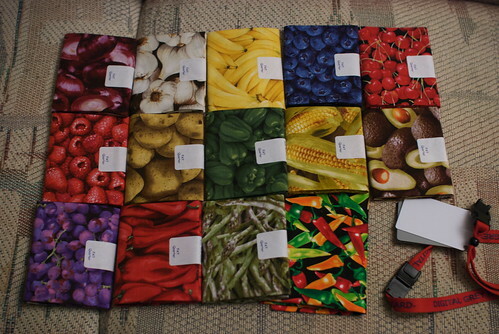 Berries, fruits, vegetables, all intended to be 'blender' fabrics to bridge a gap between one color and another. Instead, they were my focus fabrics. They've sat on my couch for months, because I hadn't the foggiest idea how I wanted to work with them. Since they were all of a series, I thought it a shameful waste to cut the fabrics so small that their subjects became unrecognizable. Past that, I didn't know what to do. Fast-forward to my growing obsession with tilings, and a rather prophetic statement from Sean Berry (holy crap haven't referenced him on this blog in years! ): "Not every quilt has to be difficult to be beautiful or loved." I'm paraphrasing, but that's the gist. As I was preparing to dive off the deep end of aperiodic tilings and custom-made piece templates, I thought ... why not have something simple in the background to work on when the insane angles got to be too much? I pulled out these fabrics and thought, yes. Half-square triangles. Mix and match. Half colors, half white. Simple, bright, and colorful. -- and then Tamara announced her leaving right around the time I started cutting triangles, and she was on my mind the entire time. Who would replace her? How would we train the next person? How best to affectionately haze her in the time remaining? 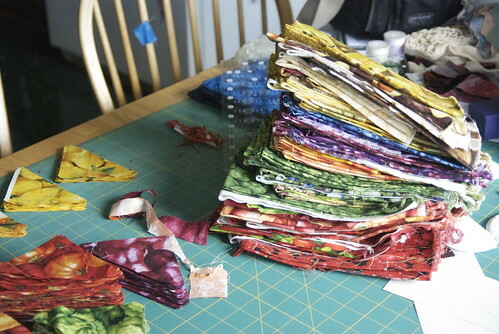 I looked down at all the pieces in front of me and had a chuckling realization: Tamara, who was vegan, could eat every subject of these fabrics. I flipped through them to be sure, and took them in to work the following Monday and showed her. She laughed, and that sealed it; it was hers. She understands that it won't be done particularly soon, but that I am indeed working on it in fits and spurts. So -- yes. Outside Context Problem #1: solved. OCP #2: what do I do with the rest? 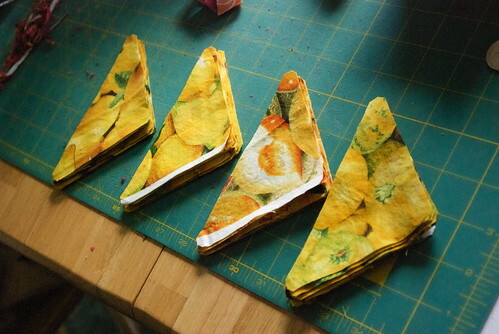 I have to cut more triangles, true, because Tam and Dennis use a king-sized bed, but even after I cut more out of that stack, there's enough for at least one more quilt and possibly two. LOVE this. What a fabulous idea! I still love these fabrics. I love the color, the photographic style, and the subject. When I originally bought some, I tried to limit myself to just a few (the ones seen as fat quarters in the one photograph in this post). Amy sent me back to get samples of everything.